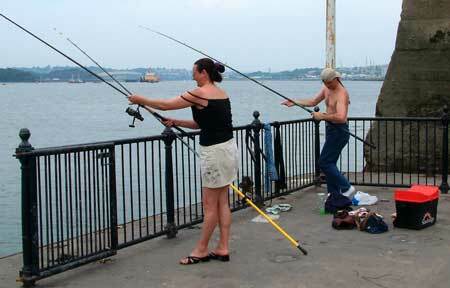 Fishing is popular in Devonport, for both men and women. 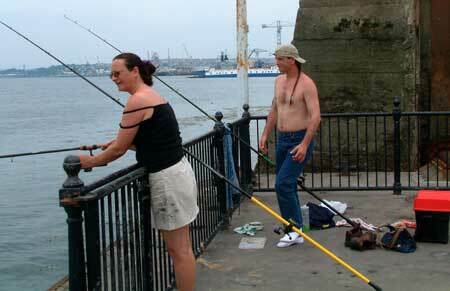 Here's some images of a couple fishing off North Corner pontoon, in July 2003. The pontoon is at the bottom of my street, so I stroll down sometimes with my camera - on this particular day the people fishing were Rob Tennant and his partner. From this spot the view is across to Torpoint - the Torpoint Ferry is visible in the background. 'Flaming Zebu' writes the following about Mutton Cove…. "It's where I took my seven year old daughter for her first ever fishing trip, and she got quite a reasonable Pollack (about 3/4lb) on the float with ragworm, in near the wall. There's a reasonable array of cod relatives down there, I've had some pout and whiting on the bottom with worm baits. You might see some small ling, codling, poor cod. Also there's wrasse, doggies and bass, though the bass may have moved offshore for the winter. Try lugworm tipped with squid for the winter species. Ragworm and shellfish for the wrasse. Fishy baits or prawn for the dogs. Spinning could produce some of the bigger Pollack or some bass. I had a few decent mackerel and some garfish down there on the float in the summer months, but not sure how much they're still around for the winter months." 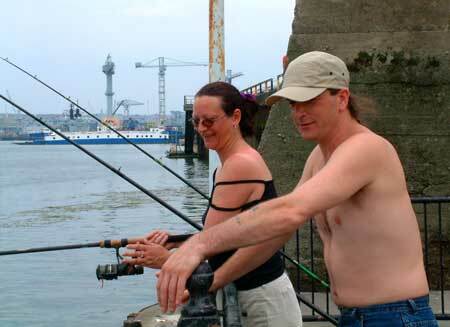 'Mike' writes … "the pontoon has a multitude of mullet and bass to the left hand side." And 'Flaming Zebu' mentions the following about North Corner …. 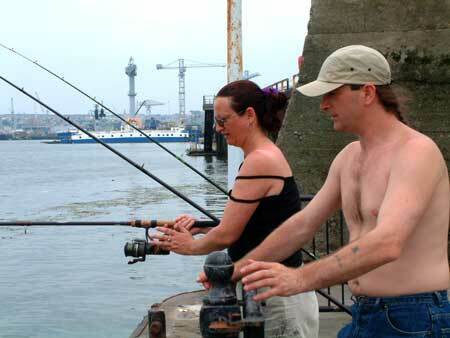 "Some nice mullet hang about under the pontoon, especially on the left. To the left, at about a 45* angle, roughly 30 - 40 yds out is a deeper gulley where some of the bad boys like to hang. To the far right and out a bit, is a sand / shingle bank (apparently). Cast further out and straight, for rays ( try prawns for these ). There is a chance of a cod if the water is coloured, though I don't know their habits there. Oh, and I've seen nicer wrasse there than at Mutton Cove." The main link to their site, which is a must-read for fishermen, is here.